Whew! What a week! Where to begin? I guess we can recap from last weekend with a bit of overlap and then tell you all the exciting things we did this weekend. 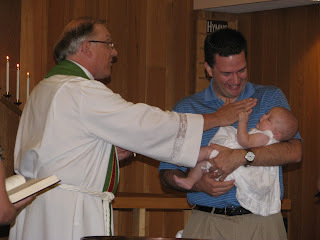 As you know, M&D and I went to Eugene last weekend for my baptism and to celebrate Daddy's birthday. We had a great time in Eugene and I got to meet lots of family I had never met before and saw Grandma Jan, Aunt Shannon and Grandma Linda for the first time in a long time. We had a lot of fun! 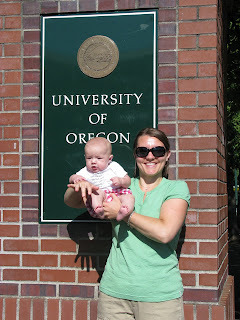 Mommy and I on campus at the U of O!!! Go Ducks!!! Here I am with Devon (L) and Taylor (R)...Daddy's other "nieces"
On Monday night Grandpa Randy came over and we went to dinner. We had a nice dinner at Claim Jumper and then went and played mini-golf. My first ever golf, but not my last for sure! Daddy packed me around the entire time in the front pack and he said I was his "handicap". Nevertheless, Daddy prevailed over Mommy and Grandpa despite my kicking him, spitting the pacifier out, and making him hold me over the last 3 holes and forcing him to putt one-handed. M& D messed up and forgot to take the camera, but luckily Grandpa took some pictures with his phone. 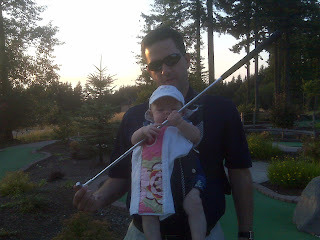 Here is me trying to take a bite of Daddy's golf club! On Tuesday Daddy's co-worker RaeLynn came over for dinner. She was in town for work so we decided to have a little BBQ with the 4 of us. We had a lot of fun and RaeLynn got to feed me twice (as you can see). It is rare for Daddy to see many of his co-workers as they are all a long ways away! RaeLynn was visiting us from some far away land called Minnesota! Thanks for visiting RaeLynn! Gale is going to be SO jealous! On Wednesday Mommy surprised Daddy with some news about me! I have sprung my first tooth! If you look real close in the picture below you can see it starting to come out from under my gums up top. Mommy says it is rare for a tooth up top to come in first, so we wonder if more will be coming along soon. I haven't acted like it hurts.....yet. Do you see it??? We swear it's there!!! On Thursday Mommy and I had a really busy and fun day. We drove downtown in the morning and parked near the river. We wanted to take a nice walk downtown to Pioneer Square where they have "Noon Tunes". They play live music downtown for an hour or so during weekdays in the summer and we thought we'd check it out. Mommy called Daddy at work and he was able to come downtown and have some lunch with us since he doesn't work too far away. It was a nice spur of the moment lunch and the music was good. Daddy could only stay for a little while, but it was nice seeing him. Afterwards Mommy and I did some shopping downtown before walking back to the car and driving home. Then Thursday night we went to another concert! This one was nearer our home and we went because Mommy has been meeting other mommy's online to get together for activities. We met up with Heather and her daughter Fiona (who is 2) and Fiona's dad...I forget his name. The band was made up of older gentlemen and lady who went by the name "Nurse Ellen". They played oldies but goodies. It was a free concert and they gave away raffle tickets when we got there. One of the tickets we had was called and Daddy got to go pick a prize. I wound up with some crayons made especially for the bath tub and I get to play with them when I get older. On Friday we went to my friend Aoife's home to an annual party her parents have. They do a party every year when the day, month and year match up. This year it was an 8/8/08 party. There were TONS of families and little kids there and we had a really good time. 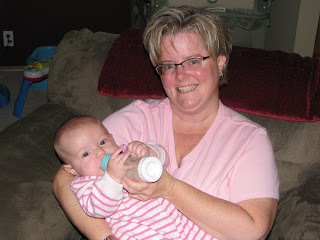 Mommy met Kelly, Aoife's mommy, on an online group along with some other moms and we got to visit with them. It was a lot of fun to hang out with all of the other babies and little kids. I am sure M&D had fun talking to all of the other parents and sharing their stories, trials and tribulations with each other! That brings us to Saturday. M&D invited some friends over for a BBQ in the afternoon. It rained overnight and M&D were scared about the weather. The rain held off, however, and the day wound up being pretty nice. 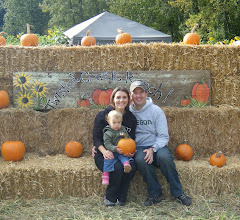 It was a nice mix of families and other friends and M&D were very happy with how it all turned out. They were kind of sad when everyone left as they could have hung out all night. 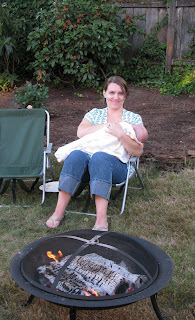 But, we got some quality family time and we broke in our new firepit! Daddy made a fire in it and we sat outside until the mosquitoes came out. Nothing like the great outdoors...even if it is your own backyard! Um, yeah....on that note....have a great week! What a lot of good pictures. Tell your Mommy and Daddy that Grammy isn't able to see the videos on her computer, but I sure do want to see them all, especially your Daddy on your playhouse slide. Did he squish it???? I see the little while spot on the upper left. Is that it? How are you doing with such a new thing to explore and play with. Have your fingers found it yet? Grammy has been looking at some pictures of your Mommy when she was your age, and although you don't look exactly like her; theres some of your Daddy in you for sure, you do look like her in some very important ways...like dimples! 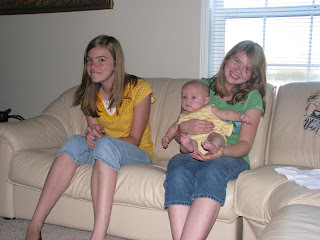 Maddie, I am so glad I was there to share in just one of the special days you will have in your life. I am so proud of you for being such a good girl in church. I am glad Daddy didn't get stuck in the slide, although that may have been worth some money since it would have been on video. Wow, a tooth!!! what a big girl.